I have been disappointed in the lack of a detailed examination of the political dynamics of the I-1631 carbon initiative, with perhaps the best one being the Seattle Times analysis. So let me try here. I am doing this now because I have been an active participant in the process, supporting the no side, and I don't want to seem to be gloating (if the initiative is defeated) or evincing sour grapes (if it is approved). And in this blog I will examine whether I-1631 will pass. The 1631 initiative race is an important one, with substantial implications regarding our ability to work together in a bipartisan way, to respect differing opinions and free speech, and in using facts, rather than ideology, to guide policy. Initiative 732 went before the voters in 2016, and provided a more aggressive carbon tax than 1631 but was revenue neutral, meaning that all the money was returned to WA citizens. It was supported by a fact-driven, bi-partisan group (CarbonWa) led by economist Yoram Bauman. I was deeply impressed by the CarbonWa folks and strongly supported this initiative. 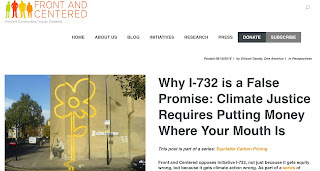 732 had a lot going for it: it was not regressive (its refunds made our State's terrible tax system better) and used carbon pricing to discourage carbon use and to promote innovation. This year, William Nordhaus received the Nobel Prize for showing the carbon taxes are the optimal way to move society to less carbon usage. But rapidly it became clear that there were problems--not with oil companies or conservatives--but on the left side of the political spectrum. The Alliance For Jobs and Clean Energy and its major members (such as some labor unions, Climate Solutions, and the Front and Centered group), which had a strong social action emphasis, were unhappy. They wanted the funds from the carbon tax to be used for climate justice, green jobs, social action, and direct investments in renewable energy projects, among other things. The Alliance tried to convince CarbonWa to drop I-732 (even though CarbonWa had all the signatures) and when CarbonWa decided to got ahead with 732, the Alliance and its left-leaning coalition members decided to either withhold support or to actively oppose I-732. Some Alliance members also demonized the leadership of 732, saying they were insensitive to minority communities. 732 had some other issues as well. The word tax was in its description, which was anathema to some. And although its policy was attractive to some moderates and Republicans, it never got the support of enough voters on the right. Although 732 was very good policy, it was perhaps difficult to understand by some (tax plus refund) and with the Democratic leadership not willing to help, it was a hard sell. It is noteworthy how the Alliance turned away arguments of the perfect being the enemy of the good regarding 732. And the Alliance (and the Governor) used a very phony argument to oppose 732: that it wasn't perfectly revenue neutral (truth: it was very close and any slight differences from neutral could have been easily adjusted by the legislature). Without the support of some labor, most environmental groups, the Governor, and the "progressives", I-732 lost, and an extraordinary opportunity to initiate a bi-partisan effort to deal with climate change was lost. If the legislature was doing its job, there would be no need for carbon initiatives, and last session there was an attempt to put together a package (SB 6203), pushed by State Senators Carlyle, Palumbo, and others. It's carbon tax was lower than 732 (or 1631) and thus of limited effectiveness, had a lot (too many) exemptions, possessed advisory boards similar to 1631, and lacked a clear vision of what to do with the money. 6203 never even got out of committee, in a legislature controlled by one party. 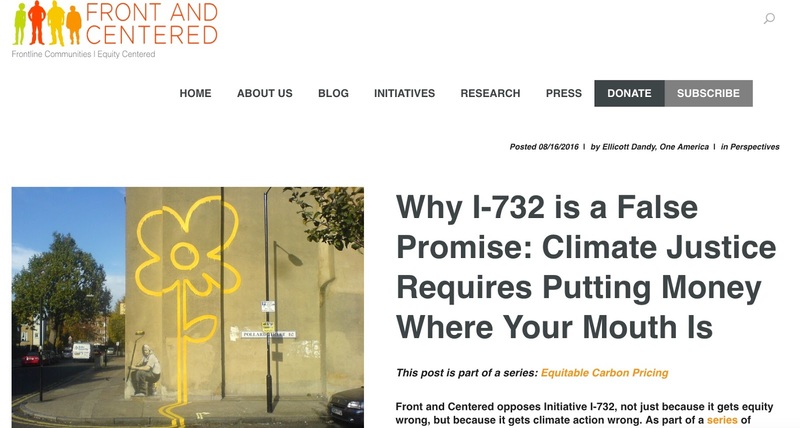 As soon as 6203 failed, the group that helped defeat I-732 (the Alliance, some labor, Indian tribes and others) were ready--they unveiled I-1631, a carbon FEE initiative, in which the acquired funds (over 2 billion in the first five years) would be used for a variety of unspecified climate justice, renewable energy, jobs, and adaptation programs. The core of the I-1631 alliance approach, why they rejected 732, was their wish to access billions of dollars of carbon fee/tax dollars. And 1631, if passed, would give them that access. But the 1631 group had a problem There is substantial documentation that climate change is WAY down folks list of important issues, and that few are ready to make any kind of financial or personal sacrifice to reduce carbon in the atmosphere. Even climate researchers are unwilling to reduce their carbon-emitting travel. I hate to admit it, but my climate research colleagues have the worst carbon emission profiles of anyone I know. The I-1631 organizers knew that climate change would be a loser in an initiative, so they transformed the initiative into an effort for clean energy, clean water, clean air, healthy communities and jobs! Who could be against that? Global warming? Climate change? Not much talk about that. Climate change was something the 1631 crowd generally avoids talking about. Because even if I-1631 met its goals (reducing carbon "pollution" by 20 millions tons annually by 2035), global temperatures would only be lowered by about a thousandth of a degree. The 1631 leadership decided to spread around the carbon fee money to their coalition, first by creating a supervisory board in which they would have a lot of representation and control, and second, by hardwiring money to parts of their coalition (Indian tribes, labor, social action groups). So 1631 was designed to be attractive: a very low carbon tax, while spreading around a lot of goodies to the members of the supporting coalition. And it even advertised that someone else would pay--the big, bad oil companies. And an important issue was that this "largest coalition ever" had virtually no representation from Republican and conservative groups, and thus 1631 was highly partisan. It would never serve as a model for the rest of the nation. And then the 1631 folks got lucky. Wildfires return to British Columbia, eastern WA, Oregon, and California, with substantial smoke over Washington. The fact that a century of wildfire suppression and poor forest management was key for generating the big fires, and the fact that fires are a natural part of the regional environment was ignored, as was the fact that a lot of smoke came from BC, where a carbon tax is in place. Research showing that climate change is only a small contributor at most of our recent fires was ignored as well. course. Global warming is not a major contributor to our local fires and the initiative does not commit the huge sums of money needed to restore our east-side forecasts (thinning, removing debris, prescribe burns). As the saying goes: truth is the first casualty of war....that appears to be true of initiative as well. However, the smoke had a huge psychological effect on the region and the 1631 crowd was ready to milk it for what they could. And 1631 missives/tweets/message suggested that Hurricanes Florence and Michael resulted from global warming (not true, GW only increased them by a few percent) and made use of hurricanes in their imagery. Truth again a casualty. In early October, the Elway polling organization took a sample of roughly 500 WA state registered voters, and a question about I-1631 was included. This poll suggested that 50% were in favor, 36% were against, with 14% undecided. A good sign for the initiative? Maybe not. Elway himself stated that the undecideds in initiatives tend to drift towards the no side. More importantly, in his experience few initiatives pass that start out with 50% or lower early in the season. But there is something else: the question used was flawed. The first line is "This measure would impose pollution fees on certain large emitters of greenhouse gas pollutants starting in 2020." Notice it states that "large emitters" would pay. It says nothing about folks themselves paying. People tend to be happy if someone else pays for all the goodies. Even with someone else paying, only 50% supported the initiative. The implication of this wording is enormous. Folks don't want to spend real money on climate change or make any real sacrifices. With only 50% answering yes above, and assuming the Elway poll was accurate, all the NO side had to do is to deliver the message that people would have to pay themselves and the initiative would lose. And that is exactly the message the NO side is stressing. Even with substantial flaws, I-1631 has a big positive going for it: the intense anti-Trump/anti-Republican sentiments of the Democratic left. The latter group is looking for ways to push back against Republicans, to prove their power to change the agenda. Thus, many Democrats are willing to overlook the flaws and lack of bipartisanship of 1631 and push it through. This viewpoint is particularly strong among young left-leaning voters, many of which are energetically working for 1631. There is an interesting divide between "progressive" well-to-do elements and the working-class portion of the Democratic party. The progressive folks, and some of their "climate justice" allies destined to benefit from 1631, strongly support 1631, but working folks, including much of labor, are uncomfortable with it and suspect (rightly I believe) that they will pay the bills. I suspect that a lot of the working folks will vote against 1631, but we will know on Tuesday. The combination of working class Democrats and Republicans, may be enough to stop the initiative. The Yes on 1631 campaign is in a bind. The initiative itself is poorly written, hyperpartisan, will do little to slow global warming (.0001 degrees C!) and most folks understand the oversight board will not use the money wisely. So the Yes campaign has gone super negative in the public statements against the No campaign and its supporters. Headlines and mailers proclaim that the oil companies are lying! Virtually every one of their mailers talk about lying oil companies. But the Yes folks never reveal what the oil companies are lying about. The reason is that the oil companies are generally telling the truth in their messages. The Yes folks are lying about lying. In contrast, the deceptions of the Yes side ares so extensive, it would take a blog just to list them all. That people will not have to pay--oil companies will cover the tab! That the wildfires are mainly the result of greenhouse gases and global warming, and 1631 will make the smoke go away. That the initiative is about clean air and clean water, rather than dealing with greenhouse warming. Perhaps the most recent and toxic lies are the accusations that the No side is using fake endorsements for hispanic folks. The truth is that there are signed endorsement sheets for everyone listed. Is it possible that some storeowners or individuals signed stuff without a proper reading? Of course. But to accuse the No leadership of deliberate deception is contrary to the facts and it appears that the Yes group is putting enormous pressure on No supporters to change their endorsement. I really think the No side has not done a very good job in making their case. The oil companies accept the threat and reality of climate change. They should make this better known. Several oil companies would support a reasonable national carbon tax. That should be advertised. A more positive proactive stand on climate change would have quickly evaporated support for the initiative among many. And they are spending too much money, with too much advertising, that makes their funding an issue. In a normal year, the answer would be no. People are not willing to sacrifice or spend money to stop climate change. They certainly would not sacrifice without clear deliverables. People are suspicious of an unelected board making billion-dollar decisions. Working class Democrats are not favorably inclined. All the no campaign had to do was to clarify that individuals would have a substantial cost and it would be over. The Elway poll suggests to me that the initiative will fail. But the "blue wave" and resentment against Trump among the Democratic 60% of the state might be enough to push through 1631, even with all its flaws. And there is another question: might all the media coverage of climate change (much of it exaggerated and non-factual) have finally motivated people to vote for a measure that would require some sacrifice? We will find out on Tuesday. If 1631 is defeated, the Yes on 1631/Alliance group will bear a very heavy responsibility. They undermined I-732 two years ago, leading to its defeat. Then they came up with the problematic 1631, excluding moderates and Republicans in the coalition and following an approach that was problematic for the working class part of the Democratic coalition. Thus, they would be responsible for two failed attempts in dealing with climate change in Washington State. A waste of nearly 50 millions dollars for the two campaigns. I suspect many 1631 leaders know that 1631 has a good chance of failing, and are setting up the excuse: the big money from the oil companies, rather then their defective initiative. If it fails, perhaps a message will finally be clearly delivered: only a rational, bipartisan approach has a chance of moving forward. Even if it's just 1000th if a degree, surely it would encourage other states to enact changes themselves. I voted yes on 732 based on your analysis, and because of your insight as well I've voted no on 1631. I've never seen a tax on business that was not passed down to consumers. And activist advisory boards are never a good idea. Thank you for speaking out against this. Your professional peer Judith Curry is well known for emphasizing the extreme complexity of the climate change problem, rightly characterizing it as a "Wicked Problem", where solution is seldom achievable due to the ever changing variables and abundant contradictions in play. this is no idle bar room speculation. Problem complexity, the most severe identified as "wicked" or even " super wicked", has long been a field of study which has paid off in practical applications around the world in achieving functional management in all kinds of highly complex problems, such as public health care. While simple clearly bounded problems may find solution with simple black and white win / lose solutions, extreme complexity problems will always have numerous conflicting and contradictory elements that may never be ideally addressed. For example, it is highly likely that climate scientists will continue to use jet planes to travel to conferences, simply because conferences are an important function of being an engaged and contributing scientist. That is not hypocrisy - it is a prime example of how highly complex the problem that they are confronting actually is. Inherently, any wicked problem means that any functional solution will seldom seem even close to perfect to any stakeholders individual desires. Also inherent is that over time, the playing field will always be changing and the terms of solution must be flexible to adjustment. Also inherent, "solution" is seldom achievable, only functional management is. All this requires that the stakeholders - in this case every Washington voter and tax payer - must focus more on a few key highest priority central objectives to determine whether the initiative is simply moving the problem in the right direction, not the most perfect direction. If it is, we know for fact that it will require adjustment as time goes on because that is the nature of any wicked problem. And speaking of time going on - the USA, it being among the wealthiest and most opportune nations in the world, should have implemented a carbon tax two decades ago as a leader, not a follower. If so, by now it could be running like a fine tuned rocket ship, not the sputtering prototype that I 1631 is. Better late than perpetually never. We're caught between the devil and the deep blue sea. All the current choices are not very good, but I believe doing something is better than doing nothing, burying our collective heads in the sand and waiting for the best solution to fall on us from the sky. All solutions are ultimately local and personal. This household has a small super-insulated house, solar array, protected woodlands and waters on our property, tried to limit our carbon emissions by limiting our use of fossil fuels whenever possible (difficult on a small farm 10-15 from town). Still looking at more tweaks we can do that might improve (reduce) our carbon footprint a little more. I voted for this initiative even though it has flaws. It's certainly better than what's been happening. Some of the flaws can be resolved later. And it may break up some of the legislative (and partisan) gridlock. I followed your advice, Cliff, and voted "no" on I-1631. I do believe we need strong legislation and initiatives to limit greenhouse warming, whether by taxes, or incentives to convert to solar or wind power, or other alternative energy sources. The vague way I-1631 wants to collect money for this without oversight is just too nebulous for me. (Ha - an unintended meteorological pun). Thanks for your coverage of this topic. Hopefully in January we will have more members of Congress on the side of sanity, and these ideas can get national exposure and discussion as they should. I don't see this as a better late than never situation.. I would prefer to never give tax money to Indian tribes, or money hungry 'green groups'. At least the state government would be somewhat accountable for the the money they would get.. If this was packaged as anything but a green effort, it would be laughed off the ballot. There is no reason to blindly throw money at this issue. Its going to require an actual plan. I came for the weather, and all I got was politics. Thomas Mann might disagree with you. Already voted "no." This is only the latest in the never-ending stream of laws and initiatives inspired by Seattle's dreary natural climate. The fog and clouds there make the population depressed, and they react by trying to use government to make themselves feel better. And don't forget to come heli-skiing in the North Cascades. May as well dump your pollution (noise, carbon,combustion gases)on our pristine mountains. And while your at it, may as well cut down some more White Bark Pine Trees. (you know, like you got caught doing before). They're only on the sensitive species list, so no worries cuz global warming is just going to wipe them out anyway. Voted "yes" based in part on Dr. Mass' blogs on the topic. Two reasons why I did that. 1. "Well, WA won't make much of a difference anyway" can be used to slam virtually ANY carbon initiative. I have seen it used at the national level ("well, China and India aren't doing anything, so why bother?"). You start somewhere, that is how policy works and then you push and improve and revise. Furthermore, the concerns of other states not being able to learn from and improve upon what we enact is greatly exaggerated and ignores the 50 experiments we currently have running in our Union. 2. Waiting on a rational, bipartisan approach. Like me, Dr. Mass remembers the times when the parties came together to work on and through the best solutions. It's a nice notion, bipartisanship. Anyone paying attention in Olympia or DC knows that that time is gone. It's not coming back. Science is no longer nonpolitical (it's irrelevant if the scientists do not see it that way), not if findings threaten someone's bottom line. Indeed, if you know your political history the past 70-odd years has been a remarkable anomaly in bipartisanship as the parties each held conservative and liberal elements. The parties' have now sorted and their paths are diverging. I would not suggest waiting on policy changes until that changes (spoiler - it won't in our lifetimes), especially one as on the clock as climate change is. It would be fair to mention that the I-732 folks now endorse I-1631 -- look on carbonwa.org . Like them, I preferred 732's sales tax swap, but they're not letting the best be the enemy of the good. I voted no, I don't think the initiative will do much good, and was laden with special giveaways, particularly to the Native American tribes. I think this initiative is designed to make well-off Washingtonians feel good while theyjet to their next safari in Africa or cruise in the Mediterranean. Meanwhile the poorer among us will struggle with higher energy costs and slip further towards the fiscal cliff. I take the bus to work every day and eat little meat, both of which reduce carbon emissions. So I am active and looking for solutions. Just think this will do little good and quite a bit of harm. It’s really very simple. If you prefer inaction and energy corporation profits, vote no. Recapping what I said in an earlier comment about I-1631, the only possible means of substantially reducing America's carbon emissions within the timeframe climate activists are now seeking is to put a stiff price on all carbon fuels. And even that isn't enough. A program of government-mandated carbon fuel rationing combined with strictly enforced energy conservation measures covering all sectors of the American economy must be adopted. If America's carbon emissions are to be substantially reduced, it must be done nationally across the board against all carbon sources. The question naturally arises, is new legislation from the Congress needed to get the job done? The answer is no. The Supreme Court has ruled that the EPA has full authority under the Clean Air Act to regulate America's carbon emissions, and that the process used by the EPA in 2009 to determine that CO2 is a pollutant was properly followed. The Executive Branch now has all the authority it needs to pursue a highly aggressive anti-carbon policy, if it chooses to do so. 1: Acting under his or her national security authorities, the president issues an executive order declaring a carbon pollution emergency. 2: The president's executive order supplies a legal basis for the EPA to publish a Section 108 Endangerment Finding for carbon which complements the Section 202 endangerment finding previously published in 2009. 3: A National Ambient Air Quality Standard (NAAQS) for carbon pollution is established. 4: The NAAQS in turn becomes the tie-in mechanism to any carbon reduction agreements the US Government may become a party to, either formally or informally. 5: Because CO2 is a well-mixed gas on a worldwide scale, the legal approach being employed explicitly recognizes that only through international cooperation can the NAAQS target be achieved. 6: An EPA-managed, state-enforced regulatory framework for carbon pollution is established under Clean Air Act sections 108, 111, and 202. 7: In the near term, the EPA’s carbon reduction framework raises the price of all fossil fuels, doing so both directly and indirectly. Over a phased timetable, the framework eventually gains direct control over the supply, availability, and distribution of all fossil fuels. 8: A key feature of the EPA's regulatory framework is a system of carbon pollution fines which is the functional equivalent of a legislated tax on carbon. 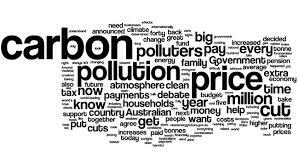 9: The carbon pollution fines are set by the EPA and are administered by the individual states, with the states receiving the greatest percentage by far of carbon fine revenues. When Barack Obama was President, his announced climate policy was to achieve an 80% reduction in America's carbon emissions by 2050. His Clean Power Plan and his other anti-carbon measures might have achieved possibly one-third of his stated GHG reduction goal. But the remainder depended upon a highly uncertain combination of accelerated technology advancements and raw unvarnished hope. It's often been said by climate activists that the science of climate change is settled; that the voting public supports quick action against climate change; and that it's only been the opposition of fossil fuel interests and the politicians who support those interests which keeps America from greatly reducing its carbon emissions. And yet Barack Obama had the opportunity and the means to move quickly forward, but he refused to go through with it. Could it be that President Obama was afraid of massive political blowback if he had pushed the kind of program which could in fact have been highly effective in quickly reducing America's carbon emissions -- but at the expense of forcing considerable economic and personal sacrifice from most Americans? DISCLOSURE: I post occasionally as "Beta Blocker" on Judith Curry's blog and on the Watt's Up With That blog. I voted no also. "Doing something" syndrome is a real problem here in Washington. We need to do something that will actually have a chance of working and making a difference. Wishful thinking is a weakness of many progressives who offer simplistic solutions that simply waste money. Cliff, I am hopeful for its passage, warts and all. It is far from perfect. But we need to do something even if it is a poorly crafted stab in the dark. Seattle has had Boeing and Microsoft. We also have Adobe, Amazon and Google. You would think with all that brainpower we would make smart decisions and quickly. But we also have Tim Eyman and several folks who use Government Services but feel that they shouldn't have to pay for them. So over the years in two areas we have argued and argued - and are now doing something about it, unfortunately at a time when the solutions are much more expensive. One item is the light rail. The other is replacing the Viaduct with the much safer tunnel. The Seattle region argued about these infrastructure projects for years while the costs kept rising. We are doing the same thing with replacing the bridge across the Columbia on I-5. By the time we agree with Oregon that this project is necessary, it will cost us much more, due to inflation of real things. With Global Warming, we don't have the time to wait for the perfect bipartisan measure. In the current highly polarized political climate that perfect bipartisan measure will never materialize in this generation. Unfortunately, we do not have the time to wait for this. I can't understand why you insist that we wait for something bipartisan when the facts point to that never happening. Inaction and ineffective action amount to the same thing. When your energy costs rise and energy corporation profits remain unchanged ('cause they're, you know, for-profit entities), who ya gonna call? The Sierra Club? I voted no. There simply arent enough provisions that reduce the economic burden on low income individuals/families. Not to mention a host of other reasons pointed out by Cliff & The Seattle Times. I believe its unreasonable to ask low income families to bear even more of a burden with only a sliver of hope that this bill will be effective at reducing carbon emissions. Sure is a lot easier for middle class and other well-to-do folk to just go with the "better than nothing" argument, but I find that argument weak and ignorant of other real problems (i.e. homelessness). A lot of folks I work with have been homeless or are homeless (living in their car). They work hard and are barely making it by. To get the working and low income class to support this bill the authors need to be less ignorant of low income brackets. I think I732 did a great job at this. In addition to reducing sales tax a 1500 rebate was provided as well. This is substantive and significant consideration of low income brackets. We have to start somewhere. The initiative can be modified by voter later. Given who is against this initiative, I am sorry you shat on your reputation agreeing with them. 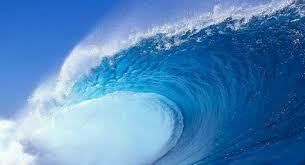 Blue wave or not. Trump or not. Its time to stop talking about climate change prevention and seriously address adaptation. Most of the real hard decisions to really seriously address limiting carbon emissions are non starters. This carbon tax really is just "feel good" legislation. Oh look we are doing something but it won't put much of a dent in our lifestyle! Have significantly less children. As in net population reduction. Almost complete abandonment of heat engines. Like that will really happen peacefully! Is there a need to go on? It’s just a power grab like everything else Progressive. It’s similar to Sawant’s push to tax big business. Just another way to get money in to progressive coffers for redistribution that nobody wants and that won’t solve any problems. A very similar story applies to Prop 127 in AZ, a renewable energy mandate that has been promoted using the same playbook (lies, disinformation, non sequitors, slander) against a broad coalition of local governments, businesses, and utilities. I support clean energy and climate change mitigation, but the tactics used to promote these initiatives has turned me off. This election has been a learning experience, where we have to choose between truth and political expediency. It’s a tough choice but I do feel we have to stand up for truth and bipartisan efforts even if all the winds are blowing the other way. I voted "Yes," but I appreciate Cliff's commentary as a sound analysis that won't receive the attention it deserves. I also strongly supported (and worked hard for) I-732, which was a much better-conceived policy in every respect and could have been a true path-breaker. If 1631 passes it will prove to be a "kludge" that we (and the legislature) will spend years monkeying with -- but it will be a kludge that will push climate policy forward. For that reason, I got to "Yes." 1) Climate change is an urgent problem - we need a solution like I-1631 now. And the longer we wait, the more expensive it becomes to solve the problem due to feedback loops & tipping points. 2) Effectiveness - he claims it is ineffective, but his only example of a policy he likes is a revenue-neutral tax that has the same cost but doesn't invest in solutions. That doesn't make any sense. Instead, the investments in solutions will help make I-1631 effective, if well-managed by people with a mix of energy, environmental, and business investment experience. 3) He pre-dismisses the advisory board's role in investing in useful solutions. They could well fund forest thinning & prescribed burns as he insists, and they will have the funding to meet those needs. This initiative can be a partial solution to the wildfire smoke problem. Cliff ignores this every time I've pointed it out to him. 4) Any policy pushed by voters in one state can lead to action in other states. We can get the ball rolling here. Maybe other states do things differently. That's fine at first - we'll work on an overarching unified national strategy at a later point, after we see what our democracy laboratories produce. If we end up with a national revenue-neutral carbon tax at a science-based level of ~$80/ton, great. Cliff should be out there making this initiative better or helping to draft a Plan B legislation that will pass in Olympia, not shooting this initiative down. Have read many of the comments here and the entire write up in the voter's guide. We know what opinions are like but here's mine nonetheless: the best outcome would be if 1631 does not pass and everyone who's posted a passionate response to this blog post works on a better solution post-2018 election. Looks like 1631 went down in flames. Thanks Cliff, sincerely appreciate your efforts! Ok cliff, now let's see YOU step up to make your imagined bipartisan plan to truly combat the climate change disaster that's rolling down on our world. I will no longer be reading your blog or listening to your radio show, Cliff. You sound more like a lobbyist for the big oil and energy companies. Very sad. I agree with those who feel that dealing with climate change is urgent. I understand the arguments made by Cliff and others against I-1631, but I still voted for it. And I agree it's high time for people who want to do something about climate change to agree to a program, as soon as possible but with a long term vision. Enough partisan posturing (e.g., "It’s just a power grab like everything else Progressive"). Enough of people with power voices throwing darts at proposals because they are imperfect. I'm not calling Cliff out on this, because he did support I-732 two years ago. However the Seattle Times was against both I-732 and I-1631. What is THEIR plan? I think we need a mixture of market mechanisms AND investment coordinated by government. There are people who are against market mechanisms, period. There are people who are against government investment, period. These people are not going to be helpful. One way or another, we need to be putting dramatically lower amounts of GHG in the atmosphere. And to do so, it is unlikely that we can continue without  some changes to what we consume, how we live, how we transport ourselves and/or  how much we pay for these. But the good news is, people are smart, people adjust, innovation happens, and (to an extent) markets work. If I-1631 had passed, I would have paid more for driving and heating my house -- in the short term ... if nothing else had changed. But things would have adjusted. I might have driven less. An electric car would have become more attractive. Puget Sound Energy would have had more incentive to phase out coal. Etc. Etc. There is a news story this week that the ozone hole is going away. We know that suffer dioxide pollution is not as severe a problem as it was a generation ago. Things can get better. We can innovate. We need people of good will and science and business and government to agree on a problem and tackle it. Cliff, you achieved your desired outcome. Now it is time for you to show that there is a better solution. You were a leading voice in stopping 1631. Will you be a leader in forging a path to putting a meaningful price on carbon? What is your plan? Now it rests on your shoulders, Cliff, to craft an initiative that we can all get behind. About a decade ago, when the economy was firing full bore and oil was over 100 bucks a barrel, Jim Prentice, then the environment minister for the Conservative government of Canada famously said " We can't possibly compromise our great economy with anything like a carbon tax". Shortly thereafter, with oil prices and the economy in the tank the predictable statement on the matter was that " We can't possibly compromise our struggling economy with a carbon tax". The other famous statement that arose out of that particular government was " most Canadians are conservative". This to a large extent is actually true in the sense that most people, not just Canadians, are indeed "resistant to change" and of course particularly resistant to the idea of paying anything for what previously was free, no matter what the context. While all this "instinct" might seem at first blush to be fundamentally wise, it can be only in a context of ignoring the future while obsessing with the present. "Resistant to change" is an instinct and intuition that is upon any skilled examination of the facts to be much closer to risk incompetence that anything wise. The first Washington State carbon tax initiative, introduced during the worst economic crash in living memory, lost by 60%. This one, introduced at a time of economic prosperity, lost by a similar margin. At some point the question arises that no matter how the carbon tax might be designed nor no matter how proven the carbon tax is as an insignificant economic risk, no matter how proven it is around the world in lowering CO2 emissions and no matter how wealthy and opportune the country in question is, that the voting public is only demonstrating Loss Aversion and the Endowment Effect, not any wise and noble calculation of risk. Cliff, thanks much for your efforts to analyze this Initiative! I like how those demanding that we must do something, anything in order to virtue signal to their friends how morally correct they are now demand that Dr. Mass repent for his sins and completely solve the problem on his own. The projection is so thick you could cut it with a knife. In earlier comments, I made the point that the only realistic means climate activists have for achieving their goal of an 80% reduction in America's carbon emissions by 2050 is to put a stiff price on carbon. Even putting a stiff price on carbon won't be enough. Eventually, if America is to achieve the 80% reduction target, a strictly-enforced program of direct, government-mandated energy conservation measures must be adopted, combined with a strictly-enforced system of carbon fuel rationing. DISCLOSURE: I post occasionally as "Beta Blocker" on Judith Curry's blog and on the Watt's Up With That blog. I work in the nuclear industry, and my basic opinion is that nuclear power has no future in the United States unless the US Government intervenes directly and forcefully in the energy marketplace to double or even triple the price of natural gas. My Internet handle 'Beta Blocker' as used on Judith Curry's blog and on WUWT reflects the situation that most of my occupational radiation exposure has come from beta-gamma sources. OK, that said, and in this context, what are we to make of Tuesday's election results? Nationally, it's clear that with the loss of the House of Representatives, Donald Trump's presidency is in deep trouble. The prospects that he will be replaced by a Democrat in the 2020 election are much higher than they were before Tuesday's vote. The odds are now that a Democrat will occupy the Oval Office in January, 2021; and that the Democrats will take full control of the Congress in 2021. This will leave climate activists in much the same position they were in at the beginning of Barack Obama's presidency in 2009 -- their batter is at the plate in the catbird seat with three balls and no strikes, and they have players on 1st, 2nd, and 3rd ready to score. Here in Washington State, it is just as clear that while many if not most voters say they are worried about climate change, they are not so willing to make the kinds of personal sacrifices needed to greatly reduce America's carbon footprint in the short span of time climate activists say is necessary. A US Congress controlled by Democrats in 2021 will certainly enact greater incentives for renewable energy investments and for government-sponsored energy conservation programs. But they will not legislate a stiff tax on carbon, much less enact a system of government-mandated carbon fuel rationing. The political blowback would be severe. If the president who replaces Donald Trump in 2021 wants to achieve an 80% reduction in America's carbon emissions by 2050, he or she must do what Barack Obama refused to do -- to employ the full authority of the EPA and the Clean Air Act to directly regulate all sources of carbon emissions to the maximum extent allowed under currently existing law. In other words, to use the authority the President already has as Chief Executive to make all carbon fuels just as expensive today as they will be in a hundred year's time, and to limit today's supply of carbon fuel to what it will be in a hundred year's time. If the goal of climate activists is still an 80% reduction in America's carbon emissions by 2050, there just isn't any other way to do it. If Trump's replacement as president doesn't make it happen, nobody else will. I think the sad truth is, the world is addicted to oil. We will not stop using until it's gone. Price could be $10/ gal and will still all get burnt. I can only see 1 feasible option. Build more hydro damns (with bypass streams for fish) and start converting desert areas to forests or other green co2 converting spaces..
Lots of jobs with this idea.. I voted NO on I-1631, not because I'm climate scientist and know so much on the subject. But I do enjoy reading and learning about it since way back in college when I took some courses in meteorology. I read as much as I could what Cliff and others had to say against it and it made sense. Another big factor is that I simply don't trust both the neoliberal ideology and the poor management provided by those running our government. At least in Seattle, the most important issues are disregarded. Great to see 1631 go down as well as similar measures in AZ and CO. This proves that even in deep blue states, voters can tell the difference between alarm and adaptation. And also that voters can tell the difference between science and consensus political activism. I am constantly amazed at your ability to constantly blame "liberals" for climate change initiatives when conservatives DO NOTHING. Any of these bills could have passed if CONSERVATIVES took the initiative and worked with labor, etc al. Mind you, I may share some of the same qualms as you about these initiatives, but the difference is that I actually put much of the blame on Republicans who hate science and oppose any action on climate change. When will you hold them accountable?? Every time liberals actually co-op a conservative idea, like the carbon tax or the ACA (Think Heritage Foundation), Conservatives then turn around and oppose the very same ideas they opposed strongly. In your opposition to Climate Change initiatives -and blaming Democrats for not passing them, your comments come across as devoutly partisan. If you are wondering where you stand, take a look at the "cool" reactionaries who flock to your blog. By your audience, one can get a feel for your real politics and what frankly appears to be a lack of intellectual honesty. I really don't see much reason to follow this blog anymore. Too bad, when you stay away from politics the weather stuff is fun. JeffB raises the fundamental single difference in attitudes of response to climate change that exists between the two political poles. The divide between Conservatives and Progressives is primarily one of response. The Conservative attitude nearly aways has been to forget about mitigation, focus entirely on adaptation. This is best illustrated by the history of James Inhoffe, who while being most famous for his climate change denialism, is actually on record as explaining that he at first believed that AGW was real and highly consequential but quickly realized how "expensive" that mitigation would be. Unwilling to accept the costs of mitigation, he now denies that consequences will be anything we can't simply adapt to. Progressives wish to prioritize mitigating the hazard before it grows to a point of high consequence risk, this does not negate the inevitability of adaptation. It simply prioritizes, recognizing that if global warming is slowed and ultimately restrained, the odds of a successful adaptation will be much higher to a less consequential risk. The notion of adapting only with no significant effort at mitigation is an interesting one, considering that fundamentally that proposes that human civilization must adapt to something that it has never experienced - ecological instability. In fact, the actual success of 500 years of modern civilization is predicated entirely upon a global ecology that has been essentially stable and predictable, whatever perturbations there have been. Something worth considering is that James Inhoffe is no outlier. It is entirely possible that Donald Trump for instance - another loudly proclaiming and widely assumed climate change denier - also accepts that it is happening but assumes that the USA will continue to dominate so long as its adaptation is more successful than the rest of the world. This might explain his obsession with "The Wall" which while hardly a realistic or necessary security need right now, likely it will be in the not too distant future, as the equatorial regions heat up. At this point in time - now nearly 3 decades into a popular awareness of the problem - I rather suspect that there are few literal "deniers" out there, despite all the entrenched rhetoric. The denial that now exists serves primarily to lower expectations of any consequential risk, yet at the same time preparing for a highly consequential risk that will effect the most vulnerable first. Because such a grim prospectus is not yet morally palatable, Adaptation is code for "Survival of the Fittest". In the absence of mitigation of the hazard by this generation , our children will be the ones who will have little choice but to adapt by walling off the less fortunate far, far more than anything seen to date. This is why Al Gore was very much correct, whatever his errors of meteorological science, in saying "Climate Change is a moral problem". And we do know quite well by now the fundamental morality of Donald Trump. Jon Kahrs, you said about Cliff Mass: "By your audience, one can get a feel for your real politics and what frankly appears to be a lack of intellectual honesty." Mr. Kahrs, let's ask a question concerning your own intellectual honesty and your own commitment to fighting climate change. It's a question that hits close to home for any citizen of Washington State, which I presume that you are. The jet airliners Boeing manufactures in the Puget Sound area are now spreading millions of tons of carbon dioxide all over the planet -- each day, every day. Every month, every year, every decade. In a spirit of taking the moral high ground on the question of climate change, would you be willing to propose that Washington State's elected political authorities force a complete shutdown of jet airliner production in our state until Boeing can produce a large commercial airplane which doesn't emit carbon pollution? If there's one thing we know about the "progressives" of Seattle, it's this: They'll be back. They have an endless need to raise taxes and reduce the middle-class standard of living to feed their elitism, their arrogance, and their chronically weak self-esteem. Cliff - the initiative has failed. My husband and I were initially going to vote yes, but we both voted NO after reading your (and some other people's) thoughts on it. Now, we still want to see some action on climate change. So what is the next step? This leaves a real void that needs to be filled! Will you help draft a bill that addresses your (valid) concerns and still does something to address climate change? Something needs to be done, and it needs to be done soon. A complete shutdown of jet airliner production would, of course, shut down current efforts to develop low-emission jets. The choice is not between doing nothing and doing everything to curtail carbon-based pollution. We can explore reasonable alternatives to high-waste business-as-usual. I thought 1631 was better in some measurable ways than 732. I get it that opponents were successful in arguing that corporations would just pass on the cost to consumers. But we won't make any progress so long as we take it for granted that corporations have a right to pass along the cost of cleaning up after themselves, whether directly to consumers or indirectly through taxation to support clean-up. They already do both. The Rewetting of the Western U.S.